Beef and carrots in an onion gravy with mashed potato. Our team of chefs carefully prepare all our meals with ingredients you'd find in your own kitchen. These comforting British Classics are warming, satisfying and full of great flavour. 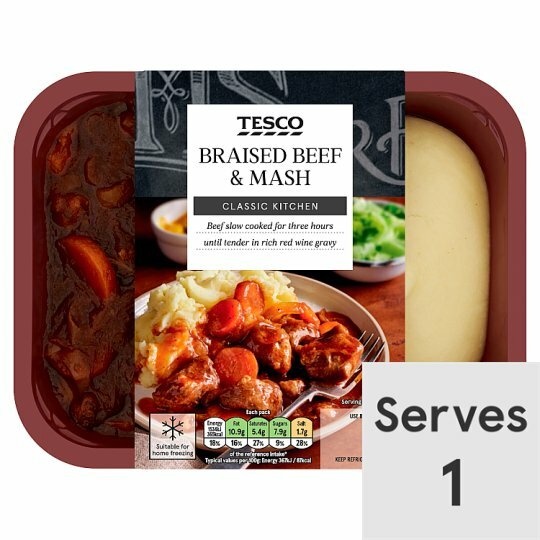 Mashed Potato (42%), Water, Beef (17%), Carrot, Onion, Cornflour, Beef Extract, Red Wine, Rapeseed Oil, Tomato Purée, Garlic Purée, Salt, Beef Gelatine, Sugar, Tomato Paste, Caramelised Sugar, Onion Concentrate, Thyme, Black Pepper. Instructions: From chilled: 190°C/Fan 170°C/Gas 5 25-30 mins Place on a baking tray in the centre of a pre-heated oven for 25-30 minutes. Leave to stand for 1 minute after heating. Stir before serving. Instructions: From frozen: 190°C/Fan 170°C/Gas 5 35-40 mins Place on a baking tray in the centre of a pre-heated oven for 35-40 minutes. Leave to stand for 1 minute after heating. Stir before serving. Heat on full power for 5 1/2 minutes (800W) / 5 minutes (900W). Heat on full power for 6 minutes (800W)/(900W), stand for 1 minute and stir both compartments, re-cover and heat for a further 4 minutes (800W) / 3 1/2 minutes (900W). Remove outer sleeve and pierce film lid several times on both compartments.